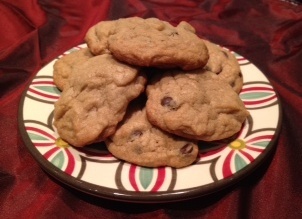 I generally am really not so good at making chocolate chip cookies from scratch. They’re either too dark on the bottom, too soft in the inside etc….it’s pretty sad really. I’ve baked those ones from the mix or the tube a few times, and they’re great, but I feel like it’s a real cop-out. But these–these were perfect. Perfect I tell you. And so easy to make! It took me less than 20 minutes from start to getting them out of the oven to cool. 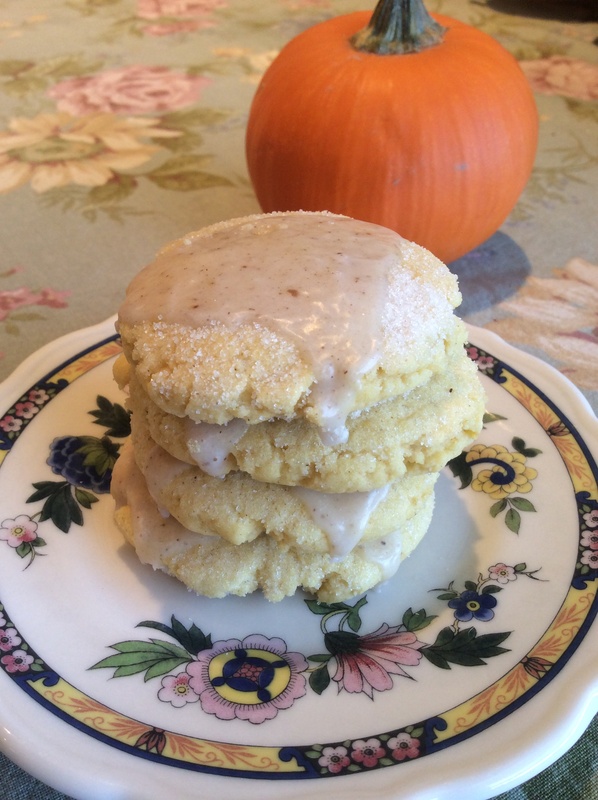 I found the recipe that I adapted to make these cookies on a container of Crisco that I had bought-probably during the holidays intending on baking tons of goodie-but never did. Preheat oven to 375. Line a rimmed baking sheet (or 2) with parchment paper and set aside. In the bowl of a stand mixer combine the first 4 ingredients and beat at medium speed until light and fluffy. Scrape down the bowl when needed. 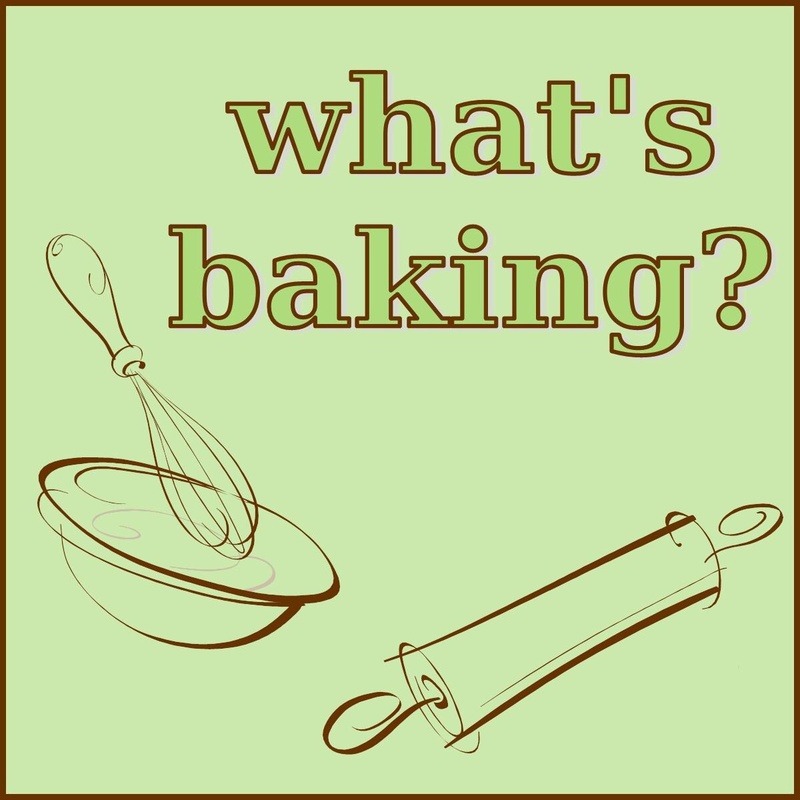 In a medium bowl combine the flour, salt and baking soda. Stir with a wisk to evenly combine. Slowly add the dry ingredients into the bowl of the mixer on low speed and mix until just blended. Fold in the chocolate chips with a wooden spoon. Place rounded tbsp of dough 2.5 inches apart on the prepared baking sheet. Bake for 11 minutes for chewy insides and crispy outsides, a bit less for all chewy. 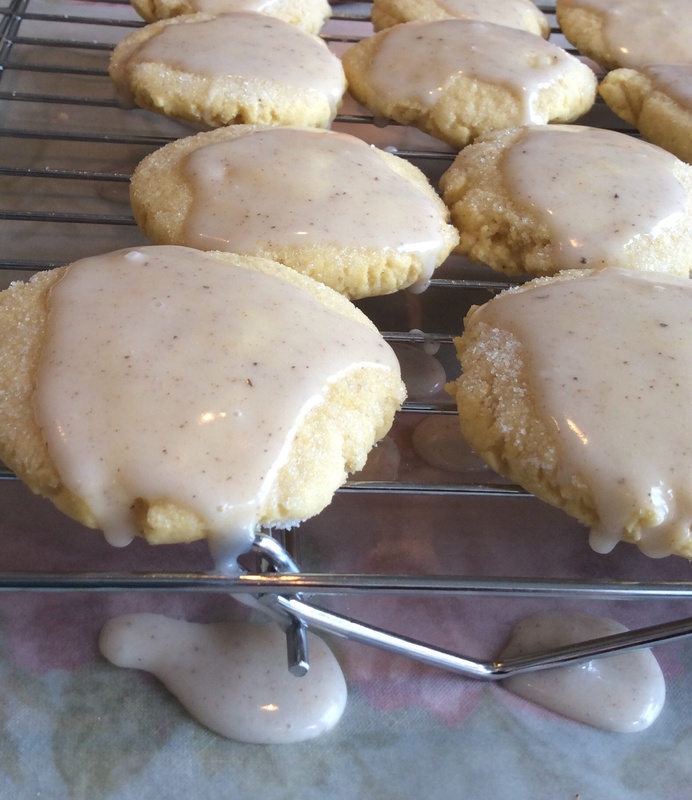 Remove from the oven, let cool for 2 minutes on the baking sheet then carefully slide the parchment with the cookies off of the sheet to cool. The full recipe makes about 36 cookies. I baked half and froze the other half in a ziplock bag with the instructions written on the bag. If there’s one sauce that I choose more than any other to have with pasta it’s bolognese. 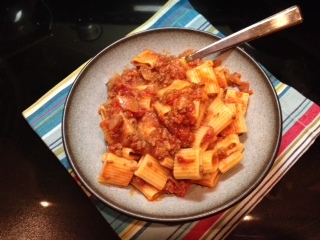 During my visits to Italy I enjoyed a nice bowl of pappardelle alla bolognese more times than I can count. The best, in my opinion, were all in Tuscany but the best of those were where they also include wild boar sausage in the sauce. Just delicious. Not to mention the many local Italian restaurants near me that each make their own fabulous version of the sauce. I had a recipe that I had been making for a while but the last few times I made it I was underwhelmed. Really disappointed even. To the point where I just threw it out. I couldn’t tell if I had over cooked it or if the tomatoes I used had a different taste or what but I knew I didn’t like it. 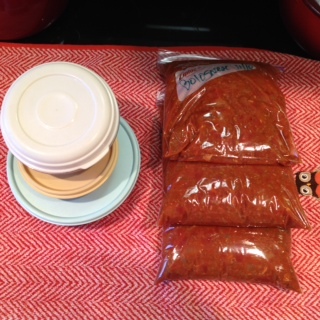 So there has been a pretty long drought for home made bolognese in my house. And then Carrie from www.carriessweetlife.com posted this beauty oh her blog. Pancetta. Red Wine (chianti-always chianti for me). Parmesan Rind. I new that I would love it. And I did. It’s my new bolognese. So a huge GRAZIE to you Carrie. My freezer is now full of yummy bolongese. I adapted it a bit and it’s just as delicious as it sounds. Heat the olive oil over medium heat in a large stock pot. Add the pancetta and cook until it’s cooked crispy. Add the sirloin and sausage and cook, using a wooden spoon to break it apart, until browned. Drain the excess fat from the pan. Add the onions, carrot, garlic and cook, stirring frequently, until the vegetables are softened. 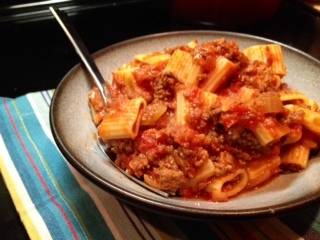 Stir in the tomato paste until it’s evenly distributed throughout the meat and vegetables. Add the wine and cook, scraping the pan to get the bits off of the bottom, until the wine evaporates. Add the stock, tomatoes, baty leaves, oregano, pepper flakes and Parmesan rind. Bring to a bubble then reduce to medium low to just simmer gently. Cover and let it simmer for 5 hours. Taste and season with salt and pepper if needed. Remove the bay leaves and rind before serving or freezing. To serve place cooked pasta and desired amount of sauce in a pan over medium heat with some of the pasta water. Stir to coat the pasta with the sauce and serve. 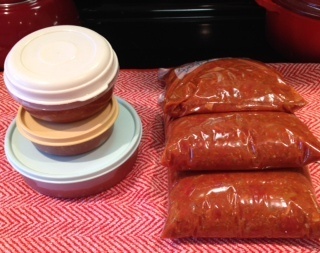 To freeze let the sauce cool completely then spoon it into quart-sized ziplock bags. Give the bags a few shakes or gentle taps on the counter to get the air to the top. Leaving just a small portion of the zipper open lay the bag flat and gently push the air out. Zip the remainder of the way and lay flat in the freezer. Don’t forget to label the bags!! So this is how much sauce this recipe makes. Those are quart-sized ziplock bags and smaller 1-3 cup containers. I have a funny feeling that the different brands of tomatoes that I used before this recipe were the problem. After cooking for a while they tasted bitter and made the sauce yucky. I recalled seeing that America’s Test Kitchen had done one of their comparisons of canned tomatoes recently so I went to their website and they recommended the Muir Glen Organic higher than any other and gave them a stellar review. They were right on! The tomatoes were perfect and tasted just like they should. I hightly recommend using them. 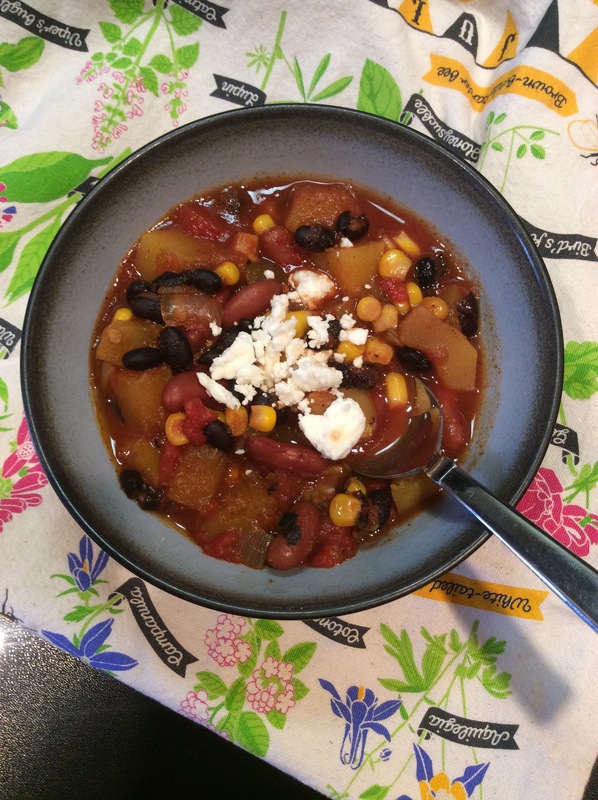 This vegetarian chili is a delicious mix of flavors and textures. It’s a perfect dish to put in the slow cooker in the morning and then have it be ready when you go home after work. I prepped the onion mixture, washed the beans and peeled and cut the squash up the night before while prepping that dinner, kept them all in the fridge overnight and then just put everything in the cooker before I walked out the door in the morning. So easy. Super delicious. You could easily add chicken or beef or meatless crumbles or, for a vegan version, use soy cheese. Into the slow cooker put the onion mixture, squash, and remaining ingredients through and including green chilis. 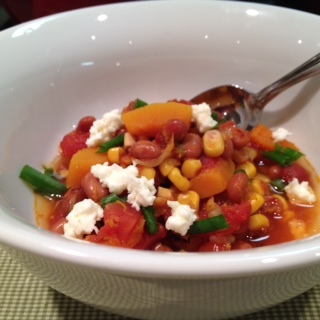 Ladle chili into individual bowls and sprinkle with cheese and scallions. 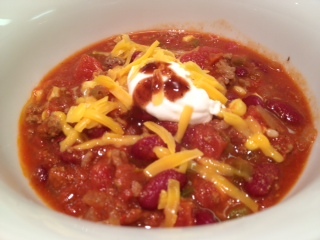 To freeze allow the chili to cool completely. 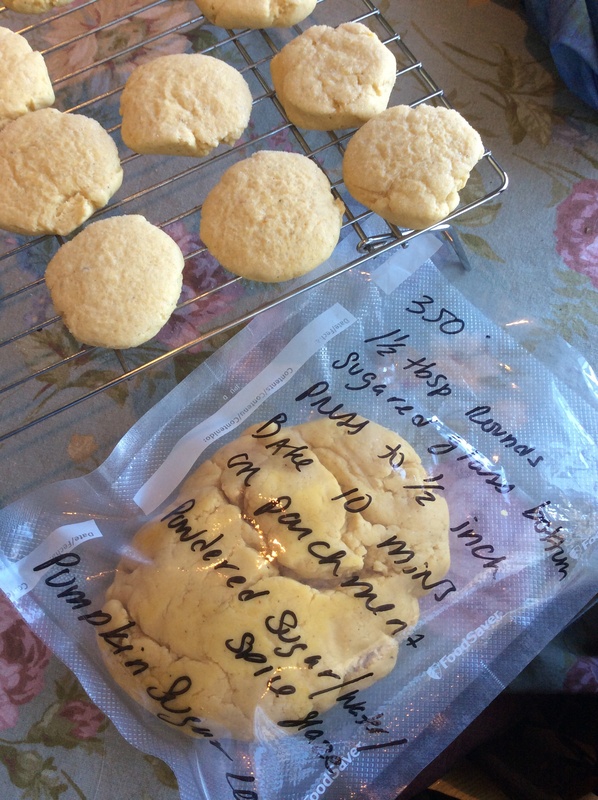 Ladle into quart-sized ziplock bags, get all of the air out of the bag, seal and freeze. Real BBQ people will be rolling their eyes at this name won’t they? It’s not REAL BBQ since 1) I don’t own a smoker (and you really need that for it to be real BBQ right?) 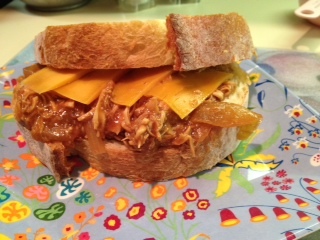 and 2) I cooked it in my slow cooker and 3) I used jarred (GASP!!) BBQ sauce. I will assume though that I will be quickly forgiven for this naming faux pas once those eye-rollers taste this chicken. I didn’t name it what I did because it’s only mediocre. It’s delicious. It’s also so easy to make it nearly makes itself. I used a BBQ sauce from my local Fairway Market-it’s their own bbq sauce and was in the middle of the line-not sweet, not hot, just smokey with a fair balance of sweet and spice-but nowhere near hot. In fact, it’s called ‘Schmokey’ which I think is cute. So get yourself a great tasting sauce for this and tuck in for a few hours. Look at that beauty!! fresh bread that can hold up to the chicken (I used fresh French bread cut thickly), thinly sliced extra sharp cheddar cheese etc.. to assemble sandwiches. Place onion and lemon in the bottom of the slow cooker pot. Place the chicken on top of that and pour the BBQ sauce and cola over it. Cover and cook on high for 1 hour and then cook for 4 hours on low or until chicken is cooked through. Using a slotted spoon or a spider remove the chicken pieces and put them on a platter to cool slightly. Remove the lemon pieces and discard. Leave the onions and the sauce in the pot and add the arrow-root 1 tbsp at a time, stirring to combine, allowing it to rest for a few minutes and thicken. It might take another tbsp or 2 but be patient-it will thicken eventually. While you’re dealing with the sauce resting/thickening shred the chicken. Forget the 2 forks. If it’s cool enough just use your hands and pull it apart. When sauce has become thick add the chicken back into it, stir, and let it cook for another few minutes to make sure every little piece has a nice coating of sauce. As far as serving I made an outstanding, but very simple, sandwich. I also think that this would be great on nachos, baked potatoes or hell just tasty with a fork. This made 5 sandwiches like you see in the photo and I froze about 4 cups as well. This was an interesting adaptation. I started off originally with the Chicken Barbecue recipe from the Cooking Light Slow Cooker book. Everything is the same until the chicken is finished cooking. The original recipe instructions were to mix flour and water and then add that to the sauce. Disaster. It rolled up into these disgusting globs as soon as it hit the sauce. I had to pick every one of them out of the sauce. Yuck. I’m glad I was able to salvage the recipe at all-even happier that it came out so amazingly delicious. The original recipe also didn’t shred the chicken or make a sandwich-just served the breast with sauce on it. So I guess this is highly adapted from that recipe. I have always bought chicken stock at the store. (If you read my roast chicken post you know that this is only about the 4th chicken I’ve ever roasted.) But this time is different. We picked most of the meat off of the bones and I put the carcass in the fridge in a container for 2 days until I had time to make the stock. Here it is in the morning before it started cooking. Excuse the green tinge-my flourescent lights do that-but in there you can see celery, carrots, onions, parsley, thyme, peppercorns and just little flashes of what’s left of the chicken. Place the carcass into the bottom of the cooker–you may have to cut it into a few pieces for it to fit. 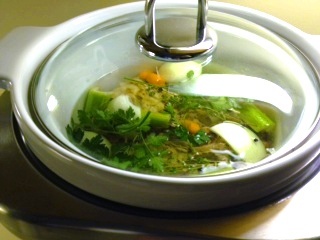 Add the rest of the ingredients through the parsley. Stick the larger pieces down into the chicken if possible. Add enough water to cover the carcass by an inch or 2. When finished cooking taste and add salt if desired. 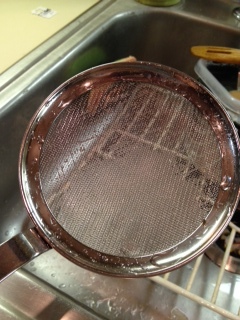 Let it cool in the cooker until it’s cool enough to handle then strain out everything, just leaving the liquid. Refrigerate until cold, skim off the fat and then freeze in portions to use later. A tool like this is perfect for skimming the fat off of the top of the stock. 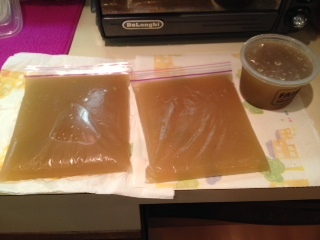 I carefully ladeled stock into 2 ziplock bags and poured the remaining stock throguh the strainer above into a small container and put everyone in the freezer until I’m ready to make soup or use the stock for cooking. I opted to NOT add any salt before I froze the stock. I will add it when I use it. The fall bug has bitten! I can’t wait to make up all kinds of soups and stews and have a gray afternoon with something simmering on the stove all day. 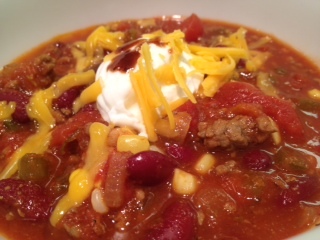 As I wrote in the post for the cornbread that I served with this chili, Husband and I had a Sunday football day at home instead of heading out to the bar with friends. That cornbread and this chili was our dinner and it was delicious. 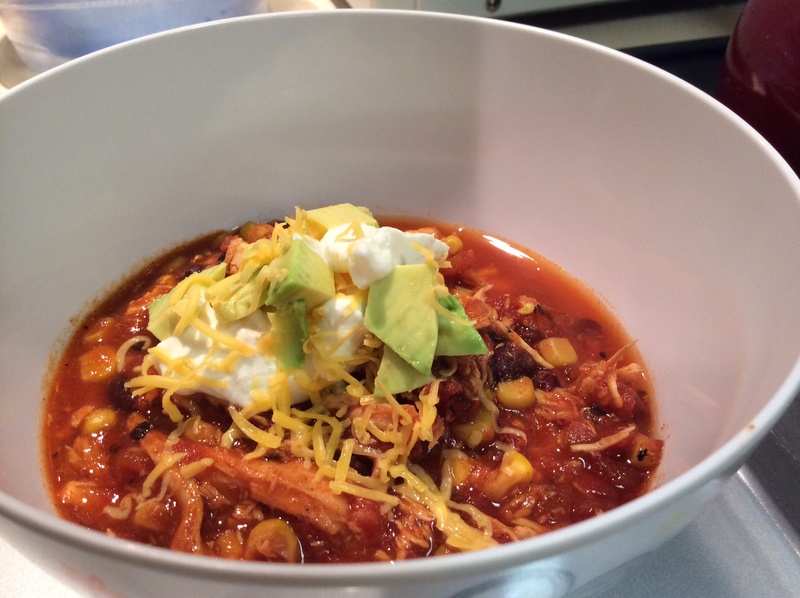 This chili is meaty, it’s bean-y, it’s got some underlying spice and heat but it’s not spicY or hot. You can always add a squirt of hot sauce if you’d like but I like to keep the heat factor down a bit and go up from there. The original recipe called for smoking the meat but since we don’t own a grill or a smoker we skipped that step. toppings of your choice-fat free sour cream, grated cheese, scallions etc..
Brown the beef until almost cooked through in a heavy bottomed stock pot, drain the excess fat, then add the onion and green pepper, garlic and jalapeno and cook until beef is cooked through. Add the rest of the ingredients and bring to a boil. Reduce heat to a simmer and cook, stirring occasionally, for at least 90 minutes. 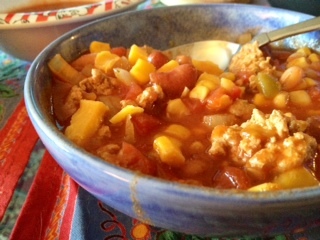 Adapted from Brother Jimmy’s BBQ cookbook Smoky BBQ Chili. I realize that since it’s only September 9th that there are still 2 weeks of summer left. You’d never know that it’s still summer. Everyone apparently times the beginning of fall by when their kids go back to school. Well since my dog doesn’t go to school I go by the real seasonal calendar. That’s not to say that I won’t embrace everything fall early. 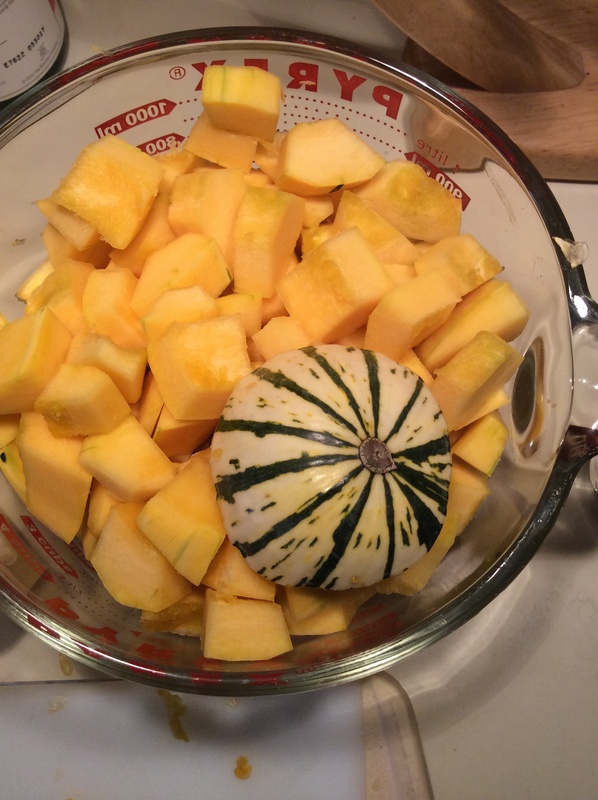 I’m looking forward to making soups and apple this and that and pumpkin this and that. And I did have my first Pumpkin Spice Latte from Starbucks yesterday: non-fat, no foam, 140 degrees, half syrup-and it was perfect. It’s the PSL’s 10 year anniversary this year. Happy birthday you delicious wonder!!! So on that note my first soup of the time surrounding the beginning of fall is here. It’s a delicious concoction of ingredients you probably have all of (or most of)in your pantry.fridge.freezer already. If you read my other slow cooker recipes you know that I became quickly enamored with that little machine. Here’s another recipe to feed that obsession. It’s hearty but not heavy, it’s well spiced but not hot, it’s not too thick or too thin. In other words-it’s just right. I just served this plain in the bowl but you could always put a dollop of sour cream or green onions or cheese. In a pan over medium heat brown the turkey, drain it and set it aside. Place the turkey and onions in the slow cooker, pour everything else in and stir. Cook on low for 6&1/2 hours. Adapted from allrecipes.com. The original recipe called for adding 2 cups of water but I didn’t add any and the liquid amount was fine. The original recipe also called for using ground beef but I changed it to turkey to cut calories and fat and to use up some ground turkey that I had in my freezer. I’m sure you could also omit the meat all together and add tofu to make it vegetarian.